Image: The cast of “Downton Abbey,” courtesy of Nick Briggs/Carnival Film & Television Limited 2015 for MASTERPIECE. Mary Elizabeth Winstead as Nurse Mary Phinney and Josh Radnor as Jedediah Foster, courtesy of Antony Platt/PBS. ARLINGTON, VA; October 19, 2015 -- PBS’ winter/spring primetime schedule offers a number of exciting new beginnings, awaited returns and a few goodbyes: most notably to one of television’s most beloved dramas, “Downton Abbey” on MASTERPIECE, whose final season premieres January 3 (see a clip here). 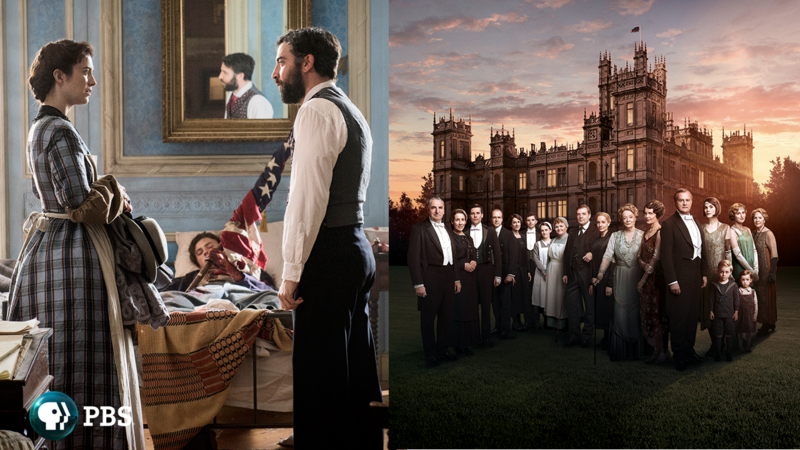 PBS welcomes the highly anticipated premiere of its Civil War drama MERCY STREET on January 17 (see a clip here), and the return of the MASTERPIECE hits “Sherlock”on New Year's Day and the British mystery series “Grantchester” this spring. On April 11-12, America’s preeminent documentary filmmaker, Ken Burns, brings viewers the two-part film JACKIE ROBINSON, memorializing the life of the Major League Baseball legend — the first African-American player in the major leagues. Commemorating the centennial of “America’s best idea,” PBS presents an encore of Burns’s acclaimed THE NATIONAL PARKS series beginning April 25. Compelling historical films are highlighted by THE BLACK PANTHERS: VANGUARD OF THE REVOLUTION: INDEPENDENT LENS by award-winning filmmaker Stanley Nelson, premiering February 16 (see a clip here); and genealogical journeys with the third season of FINDING YOUR ROOTS on January 5, hosted by Henry Louis Gates, Jr., who also presents BLACK AMERICA SINCE MLK: AND STILL I RISE, which debuts April 18 and asks profound questions about the state of black America — and the nation as a whole. To honor Black History Month, and as part of its commitment to celebrating the diversity of America year-round, PBS’ lineup enriches viewers’ understanding of African-American history, culture and experience. THE BLACK PANTHERS: VANGUARD OF THE REVOLUTION: INDEPENDENT LENS on February 23 and INDEPENDENT LENS “A Ballerina’s Tale,” a documentary about Misty Copeland, the first African-American female principal dancer with the renowned American Ballet Theatre, on February 8. Jackie Robinson, the grandson of slaves, rises from humble origins to integrate Major League Baseball, performing brilliantly in spite of the threats and abuse he faces on and off the field, and in the process, challenges the prejudiced notions of what a black man could achieve. Robinson uses his immense fame to speak out against the injustice he sees nearly everywhere, alienating many who had once celebrated him for “turning the other cheek.” After baseball, he seeks new ways to fight discrimination, but as the civil rights movement he once seemed to embody becomes more militant and he faces a crippling illness, Robinson struggles to remain relevant.